The latest addition to my collection of Infra Red (IR) Repeater circuits. The Mark 5 is a much improved version of the Mark 1 circuit and has increased range and sensitivity. It is also immune to the effects ofambient light, daylight and other forms of interference. In addition it works with IR modulation freuencies in the range 30 to 120kHz making the Mk5 circuit the best choice for compatibility with remote controls. IR2,3: TIL38 (2) or similar. This time I have returned to "first principles" and built a wideband infra red (IR) preamp which receives and re-transmits the entire baseband signal from a remote control handset. It is designed to work with IR controls using 30-120KHz and should therefore work with just about any handset. In addition I have separated ambient (surrounding) light from the modulated light used by a remote handset. The major problem with the Mark 1 circuit is that it reacts to all light sources, ambient light producing a continous signal from the IR photo diode and is amplified by the rest of the circuit. I have published a modification to the original Mark 1 circuit, click here to view. It is difficult working with Infra Red, you cannot see it, and it is difficult to measure. A major barrier with this circuit was how to differentiate between daylight and an IR signal. Ambient light produces an almost continuous signal, changing little over several hours. A signal from an IR handset contains control pulses modulated with a carrier frequency (typically 36kHz) transmitted using an Infra Red photo diode. My solution used here, is a simple RC filter formed by C1 and R3. At low frequency i.e. 50Hz the impedance of C1 is high, around 144k. The voltage gain of inverting op-amp IC2 is approximately R4 / R3, but at low frequency C1 is in series with R3 so the gain is now 120k / (3.3k + 144k) or less than unity. Daylight or ambient light will change slowly over several hours, in frequency terms this signal would be millihertz or less and C1's impedance will be megaohms. A signal from an IR handset will be modulated at around 36KHz. At this frequency the impedance of C1 is very low, around 200 ohms. This has little effect on the input impedance of the op-amp stage and voltage gain will now be R4 / R3 or about 34 times. The impedance of capacitor C4 also helps noise rejection as its impedance change will allow more signal to pass into Q1 base at high frequencies and much less signal at line frequencies. Light photons are received at IR1, this is an IR photo diode type SFH2030. A SFH2030F, which contains a daylight filter,may also be used instead of the SFH2030. The photo diode is reverse biased and when light strikes it, the energy of the IR signal releases additional charge carriers within the diode, allowing more current to flow. 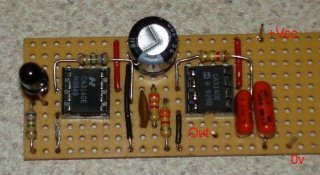 This current is amplified and converted to a voltage by the first CA3140 opamp, IC1. IC1 is wired as a current to voltage convertor, see below. In an ideal current to voltage convertor the output voltage would be the product Rf multiplied by the input current. The non-inverting input would be tied to ground. In the Mark 5 circuit the output voltage is iR1 or about 5.6 Volts/uA appearing at pin 6 of IC1. The current generated by the SFH2030 photo diode when receiving a signal from a handset several metres away is less than 50 nA and requires the extreme high input impedance to avoid shunting the signal. There are two reasons for using the CA3140, the first is its high input impedance, over 1000G. The second reason is that normally the non-inverting input would be at 0V when working from split + and - supplies. In this single supply version the non-inverting input is returned to negative supply via R2. This can only be done with a Mosfet input, hence the choice for using the CA3140. IC1 converta all current from the photo diode IR1 into a voltage. Although the SFH2030 is most sensitive at infra red wavelengths, it will produce tiny currents from daylight and also the 50/60Hz noise fields from flourescent and mains lighting. To minimize this, C1 and R3 form a high pass filter, allowing a 30kHz and higher signals to pass but blocking low frequencies. The impedance of C1 increases with decreasing frequency being 31k at 50Hz. Daylight for example, produces a contstant luminence, changing slowly over several hours, to which the impedance of C1 is effectively infinite. Looking at the chart above, at 100kHz the maximum gain can only be about 30dB. However this is ample and boosts the received range of signals from a remote handset to the photo diode which have worked well up to 4 metres apart. Because R5 is returned to the negative supply a Mosfet input opamp must again be used. The output is again filtered by a high pass filter comprising C4 and the associated input impedance of Q1. R6, C2 and C3 provide decoupling for the IR preamplifier, C3 is in parallel with C2 because an electrolytic is not always a low impedance at high frequencies. The IR output stage is comprised of Q1 and Q2 and associated components. The output is arranged so that with no input signal, Q1 is on and Q2 off; the visible LED, D2 will also be off. With no signal the 47k resistor biases the driver transistor, Q1 into full conduction. Its collector voltage will be near zero volts and the output transistor Q2, which is direct coupled to Q1 collector will therefore be fully off. Power drain will be minimal. The ouput is measured between Q2 emitter and ground. A simulated transient response is shown below. Three graphs are produced with excitations of 40,80 and 120kHz. Please note that the above waveforms are simulated using a perfect square wave input, with rise and fall times of zero seconds. The output is measured between Q2 emitter and ground with a 200 ohm resistive load. In the real world, the cable to the remote photo emitter LED's will contain both capacitance and inductance. This will increase both rise and fall times of the output signal. As with the Mark 1 circuit I recommend using speaker wire or bell wire to be used to cable the remote photo emitters. Note that the veroboard layout below only includes the componets from the left of the schematic to C4, I had Q1 and Q2 on breadboard during this testing phase. There is little to adjust in this circuit. First I suggest disconnecting the wiring to the emitters IR2 and IR3. Switch on and D2 should be off. Aim a remote in the direction of IR1 and press any button D2 should light and be seen to flash when a button is held on the handset and go off when unpressed. If all is well reconnect the wiring to emitters IR2 and IR3. Without lenses, the light is quite directional and so you will need to aim it carefully at the remote equipment you are controlling. A digital camera, or camcorder can "see" into the Infra red range. This is useful to prove that IR2 and IR3 are producing output. 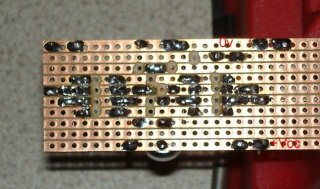 Below is a picture of my veroboard layout for the Mk 5 IR extender using Ron J's excellent veroboard images. Special thanks to Derek Smith for checking the veroboard layout and pointing out one small error (which is corrected now). Special Note:I have omitted Diode D1 in my prototype and also the veroboard layout above, and the two images below. Click the links below to view the actual veroboard layouts. The veroboard drawing above shows the component site, the yellow circles represent the breaks on the bottom (track side). Track side (97k)Note that this is reversed from component side. For more help on vero layouts see this Practical Page. If your circuit does not work, first check that your circuit is receiving power. Next compare the voltages to my prototype below. These checks are all made with a digital multimeter with a supply voltage of 12V DC. All checks are made with respect to ground (i.e. the back or negative meter probe is always connected to the negative or 0V power rail). A good tip from Derek Smith (UK, who had problems with poor noise immunity in this circuit. Derek cured his fault by replacing the SFH2030 photo diode, the new SFH2030 provided much better noise immunity. So, if your voltage levels are similar to my prototype above then try replacing IR1. If you still have problems with noise immunity check the supply voltage. Special thanks to Roch who found out that his 12V power supply was actually running at 16V. After reducing the voltage to 9V the problems disappeared for him. My original circuit ran happily from a 12V regulated supply. IR1: sfh2030 is realy sfh203 with Digi-Key live off the 0. Great layout, easy to build! I am unable to find the SFH2030 in the US. Is there a substitute for it? Can i put Ir2-3 at the end of a cable about 6 feet long?